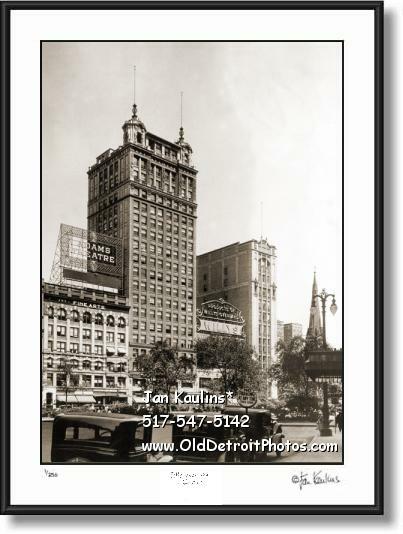 GRAND CIRCUS PARK ADAMS THEATER DETROIT photo print picture for sale. This sepia toned DETROIT OLD GRAND CIRCUS PARK phot is made from an original restored black and white 1920's photo. It shows a bustling Grand Circus Park Detroit in the 1920's. In this historic photo, looking from left to right, we can see the world headequarter of S.S. Kresge Co, the Fine Arts Building, the Adams Theatre with its illuminated rooftop spectacular sign, the Stroh Brewery Company headquarters, Willys Overland headquarters, Fyfe's Shoes, Central United Methodist Church, and severl very fine vintage vehicles parked by the overhang of the Hotel Statler.